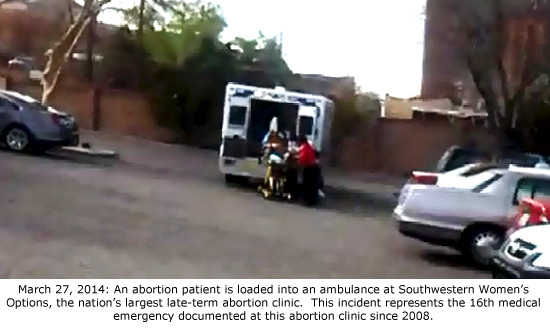 Former clinic abortionist: Susan Robinson Video Confession: UNM Official Confirms that Aborted Baby Brains Were Dissected by High School Students - Aug 23, 2016 New Docs Reveal Horrific Details of Botched 35-Week Abortion, Gross Negligence in NM Disciplinary Case Funeral home sends driver to abortion clinic to pick up "fetus" Ambulances transport two patients from nation's largest abortion clinic Eight new abortion tapes reveal casualties, callousness, and cover-up The Abortion Industry's New Low: Toilet Deliveries Injury-prone New Mexico abortion clinics operate in shadows of regulatory gaps New 911 call reveals continuing dangers at Albuquerque abortion clinics Three late-term abortionists under investigation for series of botched abortions 911 call reveals hemorrhaging following first-trimester abortion Series of 911 calls show late-term abortion clinic is danger to the public Abortion Capital, part 5: 'We think the process is safe. Nothing is perfect.' 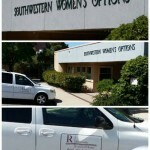 Man arrested after threatening to gun down pro-life activists at late-term abortion clinic Doctor disciplined for gross negligence in botched 35-week abortion What to Know about the Select Panel's Criminal Referral against UNM and Southwestern Women's Options Keisha Atkins died from a botched abortion here. 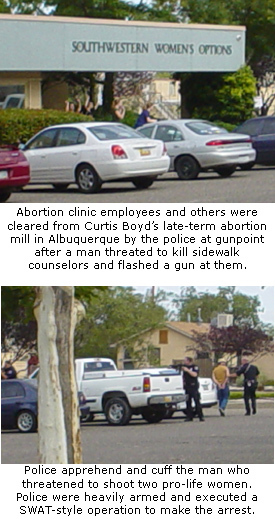 The clinic was sued, along with the University of New Mexico, UNM abortionist Shannon Carr, and other defendants. See documents below. Complaint filed Nov. 11, 2016. 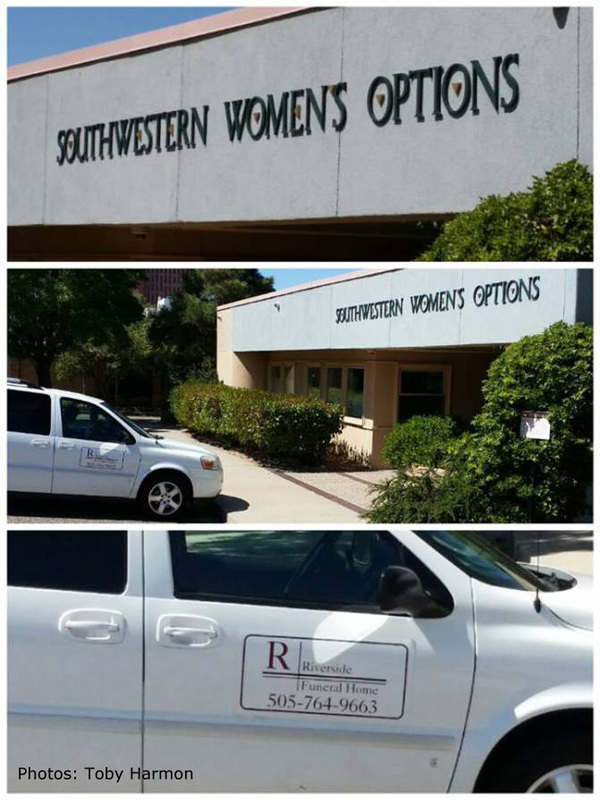 -- Patient Jessica Duran files suit against Southwestern Women's Options abortion clinic and abortionists Curtis Boyd, Shelley Sella, and Carmen Landau. Details given in document. 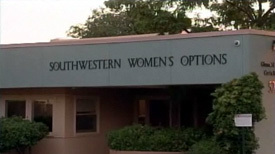 Complaint filed on behalf of the family of Keisha Atkins, who died from a botched 24-week abortion done at Southwestern Women's Options on 1/23/2017. 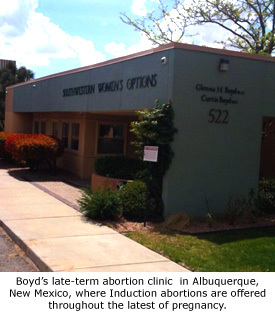 Patient Jessica Duran sues clinic abortionists Curtis Boyd, Shelley Sella, and Carmen Landau. Case history and list of court documents. Original complaint filed 11-30-2016. 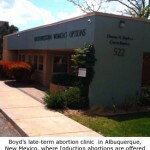 Sept. 12, 2018 news report from KOB.com concerning wrongful death lawsuit filed on behalf of the family of Keisha Atkins, who died from botched 2nd trimester abortion done at Southwestern Women's Options in 2017. 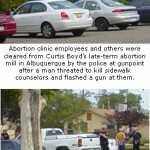 Distress call from abortion clinic; patient Keisha Atkins died the following day after a botched abortion. Keisha Atkins died on Feb. 4, 2017, as the result of a late-term abortion at Southwestern Women's Options. 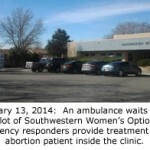 UNM, SWO's partner in the baby parts trade, did the autopsy and wrongly (in Operation Rescue's opinion) placed blame on her pregnancy instead of the abortion to cover up any culpability. This abortion consent form shows SWWO buried consent in a wordy abortion consent document, leading to questions about whether women really understood their aborted baby remains would be used for "research." List of deficiencies and SWO's corrective plan for inaccurate lab results and lack of lab quality control oversight. This survey was for the SWO lab only and not for the surgical portion of the clinic where risky late-term abortions are done. 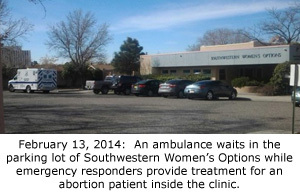 In depth report on the front page of the ABQ Journal discussing the 35-week botched abortion at Southwestern Women's Options.